Deciding to own a home is the most important decision you’ll ever make. It’s an investment that alters your life and provides you with financial freedom. Shouldn’t you protect that investment? There are many different ways to protect yourself and your home, but many people aren’t aware of the options available to them. 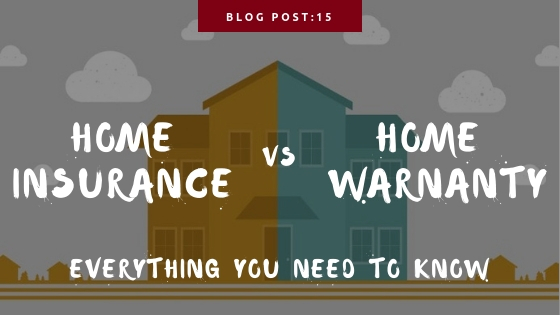 Let’s take a look at the difference between a home warranty vs. home insurance and determine which one, if not both, fits your needs. Home warranties protect vital parts of your home. These agreements are both a service contract and a replacement protection plan. Some of the components that a home warranty covers are your HVAC, electrical, and plumbing systems. Kitchen appliances, such as your refrigerator, and your washer and dryer are normally, but not always, covered. If these systems need repair within an allotted time, or if certain key components need replacing, a home warranty helps you with the cost. There are numerous coverage options available that range from full coverage to basic protection. It’s typical for a bank to require you to take out a home insurance policy before they issue a mortgage on your home. You have to renew the policy on an annual basis and pay a deductible when you make a claim. After the deductible, the insurance company covers the cost of your loss. As an example, let’s say that you experience damage to your home during a storm. An insurance adjuster will come out and look at the damage. The adjuster files a claim for damages and sends it to the insurance company. Once the claim gets approved, the company takes out your deductible and issues you a check for the cost of repairs. Home Warranty Vs. Home Insurance – Do You Need Both? The decision on the level of coverage you take out on your home comes down to a few different factors. First, you have to consider your personal finances. Can you afford the monthly payments for both the insurance and warranty or can you afford to pay out of pocket for a major loss? As discussed above, home insurance is a necessity for getting a home loan in most cases. Home warranties are similar to product protection plans. They aren’t required, but you should consider them. Warranties vary depending on the level of coverage you desire. Some only cover the basic essentials while others cover almost everything in your home. It’s important to note that when we say “home”, it doesn’t have to be a traditional house. That definition covers condos as well. There are a few things to consider before getting home warranty insurance. First, you have to think about the price. Can you afford another yearly expense? Most people believe that newer appliances are safe, but that’s not true. Factories mass produce units and mistakes happen, sometimes outside of the warranty. Most warranties have clauses in them that give companies reasons not to cover repairs or replacements. Consider a home warranty as a guarantee against the manufacturer’s warranty. There are dozens of companies online that sell home warranties, but it’s best to check with your home insurance provider first to understand what is already covered and what isn’t. Many insurers offer policy endorsements, adding additional protection to your insurance policy for your home and its contents or for types of damage that are not traditionally covered. Let’s say that a flash flood does extensive damage to your home. The water comes into your home and affects your HVAC and electrical systems along with appliances. You’re able to file a claim and have everything taken care of through your insurance company. A home warranty is going to cover for repair due to breakdown wear and tear, not acts of nature. This is why it’s important to review your home insurance with your agent before purchasing a warranty. The first thing you’ll want to know is what the policy covers. Find out what limits exist. Some policies might exclude certain components of an appliance or have a maximum payment. If your refrigerator cost $700 but the policy has a max payout of $300, you’ll need to decide if the warranty is worth the extra cost. Second, find out if they have their own network of professionals that you have to use. If they do, ask for a list so that you can go online and find out if you’re comfortable working with those people. You’ll need to ask about the claims process up front. Is there a waiting period? How do they handle payouts? How are pre-existing conditions determined? These questions might seem mundane now, but you don’t want to ask them after a disaster strikes. Finding out the information now gives you peace of mind later and allows you to make an informed decision. Now that you know the difference between a home warranty vs. home insurance, you’ll need professional help to walk you through your options. At Mathenia Insurance Group, we dedicate ourselves to helping people in the greater St. Louis area find the best insurance for their needs. Unlike other companies that offer quotes in 15 minutes or less, we believe that personalized service and real choices are the cornerstones of financial health. We offer professional advice and unbiased quotes to our customers so that they can make informed decisions. If you need help determining what insurance best protects your home, fill out this form, and we’ll start working on a personalized quote for you today.